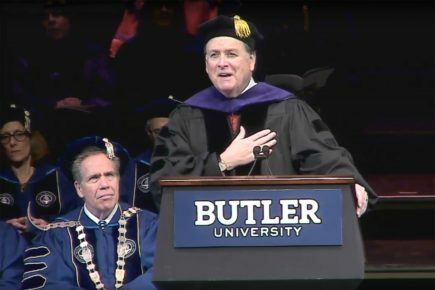 Butler graduates should clutch their diploma with a sense of optimism because they are in America and they are educated, retired Indiana Supreme Court Justice Randall Shepard told the 138 graduates at the 2016 Winter Commencement on December 17 in Clowes Memorial Hall. “This nation has created more opportunity, more freedom, more economic security for more people from more walks of life than any society in the whole history of humankind,” he said, noting that investors and governments from Canada to Canton continue to support America. President James M. Danko presented Shepard with an honorary doctorate. Trustee James P. White and his wife, Anna, also received honorary degrees. Christopher McDonald, Computer Science B.S. Chancey Seger, Computer Science B.S. Benjamin Trube, Computer Science B.S. 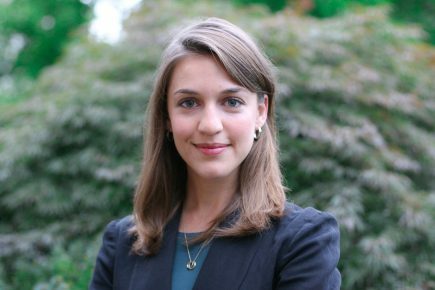 Alexandra Van Hoof, Biology B.S. "The value of an education earned in 2016 at universities like Butler is more tangible than ever." 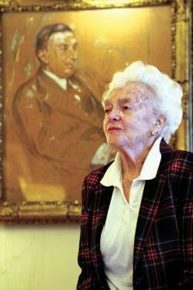 Patricia Cochran, the great-great-granddaughter of Butler University founder Ovid Butler and great-niece of two-time Pulitzer Prize-winning author Booth Tarkington, died on December 5. She was 97. Cochran, the daughter of Margaret and Donald Jameson, was a pillar of Indianapolis society, with memberships in the Indianapolis Women’s Club, The Dramatic Club of Indianapolis, Colonial Dames, Wildflower Society, the National World War II Museum, the American National Red Cross, the Society of Indiana Pioneers, and a life member of the Order of Merit. A memorial service will be held on Saturday, December 10, at 11:00 AM at Crown Hill Cemetery in the Gothic Chapel for visitation and services, followed by a reception at the Woodstock Country Club at 2:30 PM. Her grandson Richard Austin Cochran Acheson, her son, John Huyler Acheson, her husband of 32 years, Richard A. Cochran, and her siblings, Margaret Jameson Wildhack and Donald Fenton Booth Jameson, preceded her in death. She is survived by her son, Donald Jameson Acheson, and his wife, Clare Fox Acheson; her daughter-in-law Becky Acheson; six grandchildren, nine great-grandchildren, nieces, nephews, great-nieces and great-nephews, and many cousins. Patty Cochran’s connection to Ovid Butler begins with Ovid Butler marrying Cordelia Cole. Their daughter Maria Butler married Patrick Henry Jameson in 1850. Maria and Patrick’s son Ovid Butler Jameson married Mary Booth “Haute” Tarkington in 1886. Their son Donald Ovid Butler Jameson married Margaret Booth in 1915. Patty is their daughter. Patricia Cochran was a pillar of Indianapolis society. 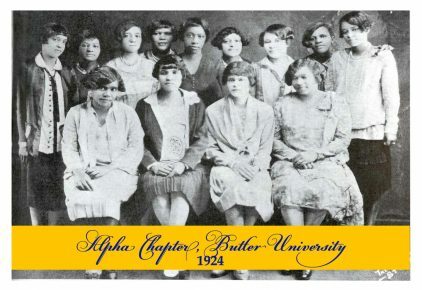 Sigma Gamma Rho, the sorority founded at Butler University on November 12, 1922, has given Butler a gift to establish the Sigma Gamma Rho Sorority Inc. 7 Founders Endowed Scholarship to honor the seven education majors and public school teachers who started the organization. The scholarship will be awarded annually beginning next fall to a student enrolled in the College of Education. “We acknowledge these courageous women through this gift in preparation for the coming Centennial Celebration of Sigma Gamma Rho Sorority,” she said. Sigma Gamma Rho has more than 85,000 members in more than 500 chapters across the United States, the Bahamas, Bermuda, the U.S. Virgin Islands, Canada, Germany and Korea. 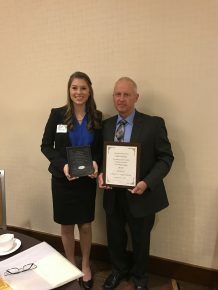 “We’re thrilled to have this scholarship to award, given the history of Sigma Gamma Rho at Butler,” said Jaci Thiede, Butler’s Vice President of Advancement. 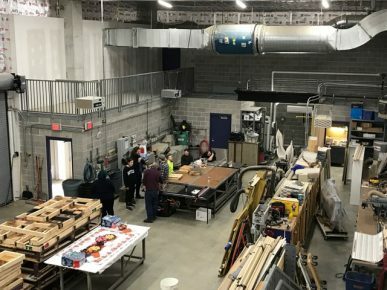 The curtain rose December 7 on the new Butler University Theatre Department Scene Shop, which has moved from cramped quarters in the basement of the Holcomb Building to much larger, well-ventilated space in the west side of the Sunset Avenue Parking Garage. Half the space will be used to build scenery for Theatre productions; the other half will be used for costume storage for the Theatre and Dance departments. At a brief ribbon-cutting ceremony, members of both departments said they couldn’t be happier. “It’s like moving out of a house built in the ‘50s with no closet space into a house with walk-in closets,” Larry Attaway, Chair of the Dance Department, said. “Such a significant upgrade,” said Michelle Jarvis, interim Dean of the Jordan College of the Arts. “The scene shop was a small, crowded space in Holcomb, and this is way, way, way, way better,” Theatre Professor Wendy Meaden said. The 40x80 scene shop and 40x40 storage spaces for both ballet and theatre costumes (which had been located in a pole barn behind Hinkle Fieldhouse) gives students and staff closer proximity to the Lilly Hall Studio Theatre, the Schrott Center for the Arts and Clowes Memorial Hall, where performances are held. It means that Glen Thoreson, the Scene Shop Supervisor and Technical Director, and crew have space with lots of natural light, a 25-foot-high ceiling, and improved air flow to build and paint sets, and they also have a garage door for easy access and exit to move sets. In addition, costumes that once were often damp or damaged in storage are now kept in a climate-controlled facility. Both Theatre and Dance have more than 10,000 pieces in the new space. “There’s so much more room to move and work,” Meaden said. At the ribbon-cutting ceremony, Department of Theatre Chair Diane Timmerman said the scene shop had been in various locations over the years, including under the old Hilton U. Brown Theatre west of Hinkle Fieldhouse. She thanked the administration and Board of Trustees for approving funds to make the new space possible, and she acknowledged the efforts of past faculty, staff, and administrators who worked to secure better space for the scene shop. “We’re standing on the shoulders of the people who came before us,” Timmerman said. “We’re so grateful for everything that was done to make this happen,” Attaway added. Butler’s Center for Citizenship and Community (CCC) celebrates its 20th anniversary on November 30 at 4:00 PM in Jordan Hall 109, and among the achievements the CCC will be reflecting on is the widespread impact it’s had on the city of Indianapolis, the University, and, especially, Butler students. 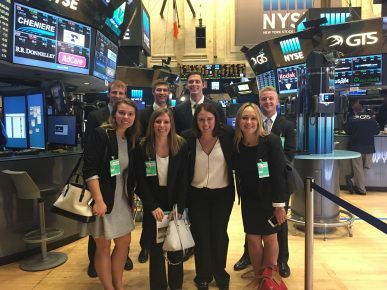 The CCC is responsible for creating the Indianapolis Community Requirement (ICR), which requires students to take one course in any part of the University that involves active engagement with the Indianapolis community. In 2015-2016, Butler students gave more than 25,000 hours of time, which translates to about $600,000 in value. 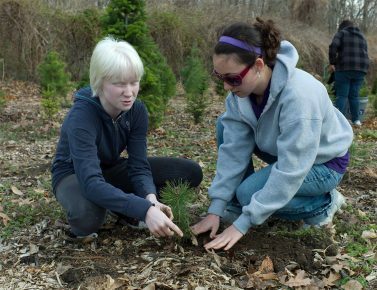 Beyond the ICR, the CCC also has helped facilitate projects that involve campus-community partnerships. This year, for example, the center is helping lead a major research project, “Music First,” which will use music to attempt to ease the suffering of Alzheimer’s patients. 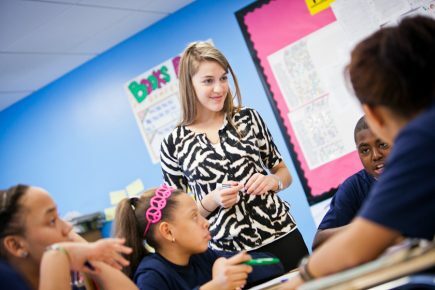 It also has supported Education Professor Katie Brooks, who secured a $2 million grant to alleviate the shortage of English as a New Language teachers. 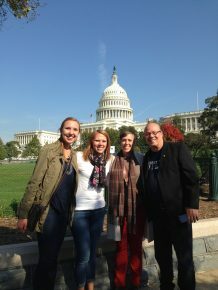 And the center has sponsored educational programs like leading a campus-wide discussion on civil discourse. But Braid said the most significant impact the CCC has had may be on individual students who have gone into the community thinking they were simply doing volunteer work and instead found that they were learning about themselves and getting back even more than they were giving. 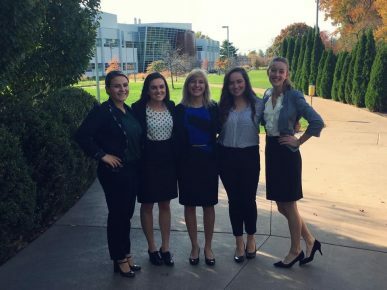 When Kate Richards ’18 came to Butler from Effingham, Illinois, she knew a little about the ICR and Butler’s focus on service learning. But the idea of communicating with the Indianapolis community was something that appealed to her. During her first American Sign Language class, she did her service learning at Miller’s Merry Manor, a nursing home and rehabilitation center, where she and another student played cards and talked with three or four deaf residents using sign language. In her third ASL class, she was assigned to the Indiana School for the Deaf, where she tutored middle-school students in math. 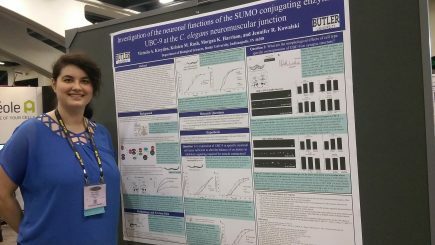 Richards, a Communication Sciences and Disorders major, has now completed four ICR courses and works for the CCC as a liaison between the Deaf School and students at Butler. In that role, she places students where they’ll have the best experience. The CCC began through a grant from Eli Lilly & Co. in 1996 with Political Science Professor Margaret Brabant as its first director. The center’s creation was an outgrowth of Butler’s role as a founding member of Indiana Campus Compact, an organization of Indiana universities that got together to recognize the value of civic engagement and the responsibility of universities to make connections with their communities. Early on, Brabant pursued Community Outreach Partnerships Centers grants from the federal Department of Housing and Urban Development. The grants help colleges and universities apply their human, intellectual, and institutional resources to the challenge of revitalizing distressed communities. Those grants, along with funding from the Nina Mason Pulliam Charitable Trust and other local foundations, launched the CCC, which initially focused on service learning, community revitalization, fair-housing, and crime and safety issues. The Indianapolis Community Requirement is one of those pieces that stayed. The CCC set up partnerships with community organizations, many of which continue to this day. 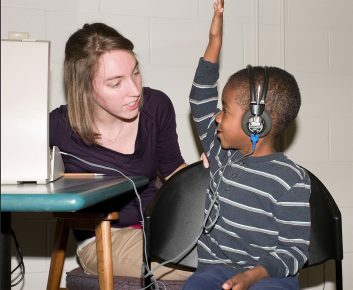 The relationship with the Indiana School for the Blind and Visually Impaired (ISBVI) is one. 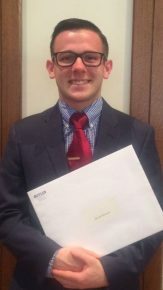 Luke Schaible ’17, an Accounting major from Findlay, Ohio, began his service learning experience at ISBVI when he was a first-year student in Braid’s Making a Difference in the World course. When he first got there, he sat in a corner—“just being my shy self”—when a student came up and asked him to play basketball. Braid said the experiences Richards and Schaible have had are exactly what makes the CCC important to Butler. “We’re interested in empathy, community, and service, which are what we think are an essential part of an education, and with students coming through a liberal arts university, we hope to generate an understanding and a practice of those kinds of values and virtues,” he said. Among the achievements the CCC will be reflecting on is the widespread impact it’s had on the city of Indianapolis, the University, and, especially, Butler students.